When travelling with a pet always remember to plan what they will be eating and drinking not only on the vacation but during the trip as well. It is not always advisable to feed a pet just before making a long journey. 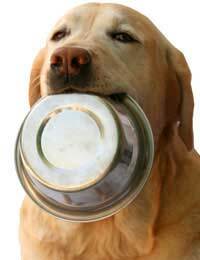 Leave a gap of 3 – 4 hours before setting off after the animal has been fed. Make regular stops if driving and give the animal a small drink and a chance to exercise before moving on. Take enough water with your for the journey, keeping it cool in a cool bag or box specifically for your pet. Although water is best stored in a cool container do not give ultra cold water to the animal especially on a hot day as bloat can occur in some animals. Remember that there are often delays on motorways and have water near to hand so that your pet does not get thirsty. Don’t leave the water bowl with your pet as it could spill and make the animal uncomfortable or he could just drink through sheer boredom and other accidents will happen! It is possible to purchase non-spill water bowls that are plastic with a lid that is designed so water cannot be spilt. If staying overnight in motels or hotels ensure that the water you provide from the bathroom taps is suitable drinking water for your family pet. Never let them drink water from the hot tap as it would have sat in a tank for some time and could upset the animal’s stomach. If in doubt boil the water and let it cool. Plan your dog’s food for the whole trip and pack it in individual containers. If taking tinned meat, remember to pack a can opener. Mixer biscuit or complete food can be divided into daily portions in sandwich bags ready for use. If you are considering taking a complete food with you for the vacation do not use a new brand as this could upset the pet’s tummy. Introduce the new food gradually over one week before you plan to set off. Keep scent free wet wipes and paper kitchen towel handy so that the feeding area, your pet and yourself can be tidied up after each meal. Use the facilities in service stations to wash the food bowl. If this is not possible a travelling kettle that works from the car battery is ideal for washing up purposes. These items can be stored in a plastic box solely for the animal’s use. Don’t be tempted to share your picnic or snacks with your pet during the journey. Not only will it excite the animal who will want to share everything you are eating but could also lead to flatulence and upset tummies in some pets. Ensure that all food and water for your family pet is well packed and covered so that it does not have the hot sun shining on it during the journey. All forms of food will not keep well in the heat and may even turn rancid. In the summer any food left in the open will attract wasps which are not only a hazard whilst driving but van cause serious injury to animals who will naturally snap at anything flying nearby.